Did anyone say symphonic metal is dead? They lied! From where else but the Netherlands should come a fresh batch of symphonic metal? The homeland of EPICA and WITHIN TEMPTATION is also the base of END OF THE DREAM. Formed in 2013 they already released their debut album two years ago. 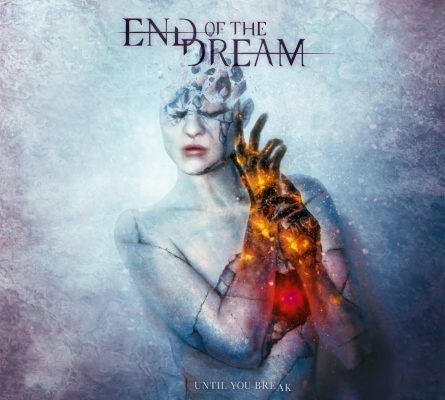 So let’s check out if END OF THE DREAM can step into the shoes of Dutch genre-giants with their second release “Until You Break”! The fist thing that caught my eyes, as I saw the tracklist and duration: this album is long! Did the band have so many ideas that they wanted to put into almost one hour of music? While listening I realized quickly, that they sadly didn’t have as many new ideas as necessary. There are often repetitions: vocal lines, guitar parts, rhythm, melodies. Just listen to the intro of the title tracks ‘Until You Break’ and ‘Defile’. The first time I thought the album is over and started anew. Fewer songs with more individual ideas would have been better. The result of Joost van den Broek‘s great production. He plays a well-established role in this music genre knows how to produce good music! Beneath the nice vocal performance of Micky Huijsmans, the good sound is the reason why END OF THE DREAM stand out from other bands of the young and wild Symphonic Metal era. Catchy, dulcet voice, full of energy fitting orchestral parts. If you like this kind of music, check out END OF THE DREAM‘s “Until You Break”! And to get to know the band a little better, check out our interview with END OF THE DREAM at Femme 2015. Don’t forget to share this article and leave us a comment below, if you also like END OF THE DREAM!